Down recovered from a nightmare start to secure a draw against holders Tyrone in the Ulster Football Championship quarter-final at Healy Park. Goals from Colm McCullagh and Sean Cavanagh had the favourites 2-3 to 0-2 ahead after 17 minutes. Down hit back with a Benny Coulter goal and took the lead on 50 minutes through a goal by substitute Ambrose Rodgers. 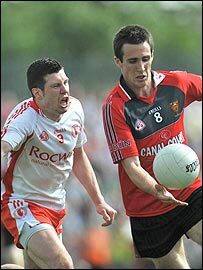 Tyrone regained the lead but Down levelled with a Paul McComiskey free to force a replay at Newry on 14 June. In the end Down may feel they missed a chance to dump the holders out of the Ulster. Ross Carr's side made a nervous start and found themselves seven points adrift after 17 minutes. Martin Penrose was inches away from a goal when his low shot trickled wide but in the eighth minute McCullagh did find the net for the Red Hands. Penrose was involved in the build-up before Brian McGuigan, playing his first Championship match since the 2005 final, supplied the perfect pass for McCullagh to go on and fire a left-foot effort past keeper Brendan McVeigh. Were Tyrone lucky to survive? Colm Cavanagh added a point before Ronan Sexton landed Down's opening score after 11 minutes. 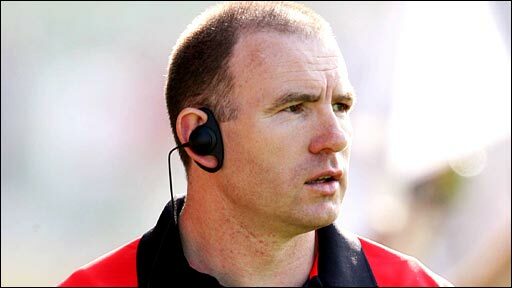 McCullagh's left foot converted two points from play for Tyrone with Dan Gordon added one for the Mournemen. But Down, who conceded 10 goals in their National League Division three campaign, were picking the ball out of their net again in the 17th minute. Penrose flicked through to Sean Cavanagh who cut in from wide on the right to beat McVeigh. It could have been all over for Down as Penrose was denied by a McVeigh save and Kevin Hughes saw his effort crash off the crossbar. There were points for Tyrone's Colm Cavanagh and Liam Doyle of Down before the Mournemen had a Gordon goal disallowed. 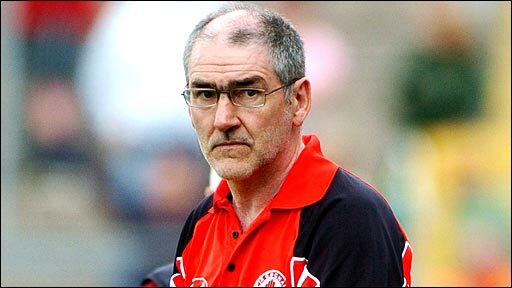 Tyrone manager Mickey Harte says that Down played great football to come back to share the spoils at Healy Park on Sunday. Down's John Clarke hit the bar when he should have scored but the Mourne county did grab a goal just before half-time when Coulter's shot went in off defender Justin McMahon. That left it 2-4 to 1-3 for Tyrone at the interval with Down getting the first point of the second half through another Doyle free. Penrose fisted over a badly-needed point for Tyrone but Down responded with points from Gordon and Paul Murphy. After Tyrone's early dominance, the contest was really alive now and, sensationally, Down went into the lead in the 50th minute when substitute Rodgers scored from a Coulter pass. Sean Cavanagh pointed to level the game and then Rodgers and Brian Dooher exchanged scores in what was now a thrilling ding-dong battle. Kevin Hughes scored a good point on the turn but in the last minute of normal time substitute McComiskey kept his head to convert a free. Tyrone:- P McConnell; R McMenamin, J McMahon, D McCaul; D Harte, C Gormley, P Jordan; C Holmes, S Cavanagh (1-1); B Dooher (0-1), B McGuigan, E McGinley; M Penrose (0-1), C Cavanagh (0-2, 1f), C McCullagh (1-2). Substitutes: K Hughes (0-1) for McGinley (15); D Carlin for Harte (43); M McGee for McCaul (53); T McGuigan for C Cavanagh (inj) (55); N Gormley for B McGuigan (61); J McMahon for Holmes (63). Down: B McVeigh; L Howard, M Cole, C Murney; A Carr, L Doyle (0-2, 2f), D Rafferty; D Gordon (0-2), J Lynch; J Fegan, R Murtagh, D Hughes; J Clarke, R Sexton (0-1), B Coulter (1-0).